A woman who fought the same cancer twice as a teenager has returned to the place she says saved her life - as a researcher trying to beat the disease. Catherine Pointer is currently studying B cells in HPV-driven Head and Neck Squamous Cell Carcinoma (HNSCC) as part of her PhD at the University of Southampton. But her first battle with cancer was at the age of 14 when she was diagnosed with leukaemia and again three years later when her cancer returned, forcing her to undergo a full bone marrow transplant. 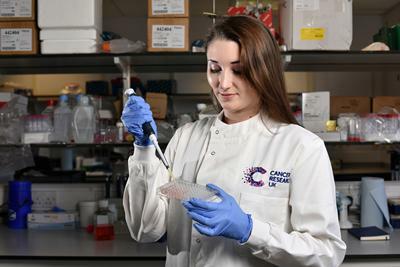 Now 12 years later - and facing her third cancer battle after being diagnosed with a form of skin cancer - the 26-year-old, is back in Southampton says she is determined to devote her career to finding better treatments and, she hopes, ultimately a cure for the disease. Catherine, who is also backing this year’s Stand Up To Cancer campaign, is based at the Cancer Research UK Southampton Centre, working among an elite group of University scientists and clinicians focussed on improving treatments and survival rates for head and neck cancer patients. She said: “Being back in Southampton but now as a cancer researcher rather than a cancer patient feels like the exact right place for me to be, like it’s gone full circle. Catherine was on a family summer holiday when she became very unwell and lost a significant amount of blood. Within two weeks she had lost a dramatic amount of weight and could barely stand without passing out. When they returned home urgent blood tests were carried out and Catherine, was admitted to Queen Alexander Hospital in Portsmouth before being transferred to Southampton where it was confirmed she had leukaemia and needed to begin six months of intensive chemotherapy treatment. She said: “There were a few scary moments with infections but overall I coped pretty well. As rubbish as I felt, there was always someone on the ward who was worse off than me. “Even before I became ill I liked the idea of being a scientist but without doubt my own experience convinced me. Catherine went into remission after four cycles of treatment. She was just underway with her A-levels when her cancer returned. After eight weeks on the transplant register, while having further chemo, a match was found for Catherine. She underwent total body irradiation as they killed off her own bone marrow before carrying out the transplant in November 2009. To the amazement of doctors, Catherine made it home in time for Christmas with her family. She said: “Cancer had already dominated my life so much. But it came to be the thing that interested me most and the only thing I wanted to choose as a career. I did work experience at Southampton and really liked what they are doing there – it feels like it is really going to make a difference. “I started my PhD in cancer research wanting answers about what had happened to me. Now I’ve developed a mild skin cancer as a direct result of the treatment. I had, it’s about self-preservation. I don’t want the next 14-year-old girl to go through what I’ve had. All I want is to grow old with my soon-to-be husband and be able to raise a family. I now know I can’t stop myself getting cancer again, but by working at CRUK Southampton I can make sure I’ll be ready for it next time. That’ll help a lot of other people along the way too.